In writing about The Noble Liar I had not realised that Premier had already published this excellent blog –In taking on the BBC, has Robin Aitken become a modern martyr for truth? But going back to Aitken’s book he has an interesting chapter entitled The BBC and Brexit . He argues about the meritocracy aspect that the BBC is filled with people who genuinely believe that they are superior. They are the ones who ‘by merit’ should be running all the civic institutions – including the BBC. He points out that an increasing number of BBC luminaries who head up Oxbridge colleges. They have a sense of intellectual superiority. As regards Brexit these people all believe that Brexit must be bad and this colours the whole coverage. He argues the BBC has a neurotic pessimism where every negative possibility is accentuated, and every bit of good news played down or ignored. This became known as the ISOB project. In Spite of Brexit unemployment is down, ISOB wages are up, ISOB there are record levels of investment in the UK. Wheras bad news is BOB – Because Of Brexit. From Honda closing in Swindon to global disaster caused by climate change – everything is BOB. “Time and again EU apologists are listened to respectfully, their assertions taken as reasonable and true, their truculent objections to British proposals given reverential weight. The sharp-edged, attack-dog treatment is reserved solely for British ministers. Why should this be?” (Page 48). You can complain all you want but “Anyone who does embark upon a complaint against the BBC will find themselves in a protracted exercise which rarely delivers satisfaction” (Page 63). The smug superiority of those who run the BBC is that largely of the Remain leaders and advocates (which is not to say that there are not those in the Brexit camp who are the same – but it is not their predominant ethos). It is a superior one based upon the idea of meritocracy. In the aftermath of the Brexit vote, which none of them (like David Cameron expected) this was explained by arguing that leave voters were less educated and more taken in by the lies, or were racists who didn’t understand the diversity of modern society. Currently its the ‘lied to’ version rather than the ‘racist’ trope that is being widely circulated. Here is an example of one such tweet. Can you see what is happening here? The narrative is ‘we were right all along. We could see the lies…but these poor people were not intelligent enough to see them”. There is no acknowledgement that lies were told on the Remain side as well. There is no possibility allowed that the Brexit case might have some substance, or that those who voted for Brexit actually considered things and thought about it for themselves. No, those who voted Brexit are either bad (racist) or mad- especially the poor who need the ‘educated’ middle class to prevent them from self-harming. This fits in with the superior ethos of so many within the BBC. Just listen to any of the comedy shows – they and their audience just know how superior and right they are. Watch Graham Norton regularly mocking Brexit at the beginning of his show. It’s an ‘in joke’ for those who just know they are so right that there can be no discussion – only mocking abuse…or the occasional self-righteous ‘let’s not humiliate the poor dumbos’. I should say however that the BBC were obliged during the referendum to offer ‘equal coverage’ and they largely did that – much to the fury of people like Alastair Campbell who, because the BBC did not act as the propaganda mouthpiece for Remain, renamed it the Brexit Broadcasting Corporation and sought to use his influence to get it to behave more in line with his view. 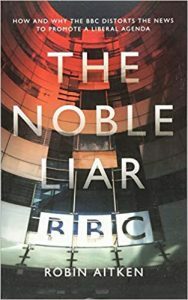 Next week we will continue to look at other issues raised in The Noble Liar but as promised I leave you with another personal story of the BBC. I have spoken to both producers and journalists who have told me a similar story. As regards Brexit one journalist told me that they found difficulty in Scotland getting business people or academics who supported Brexit to speak or be interviewed. Not because they do not exist but because they felt that such was the intimidatory atmosphere (where the vast majority of civic Scotland and the people they depend on for patronage are pro-EU) they they were scared. Another BBC person told me that they thought my social views were representative of at least 50% of people in Scotland, but that 50% was not represented in the BBC at all. Aitken is not the only BBC executive who is aware of this. You and the author of the book on the BBC are like the little boy who pointed out that the emperor’s new clothes weren’t! Why is the BBC allowed to be so partial, partisan and one sided? I’d like to know how a public service media group can act like this. Aitkin clearly outlines the issues but what about the solution? We know the truth now, though, about what sort of institution deceived idiots voted to leave, thank God. The machinations of the EU and those whose loyalty is to it, have surely exposed what the EU is, so that it both sides are equally-informed now, about that. Voting Leave or Remain in a repeat referendum would reflect not differences in information or the intelligence of the voter, but a difference in basic moral values, the idea of what was right and what was wrong. 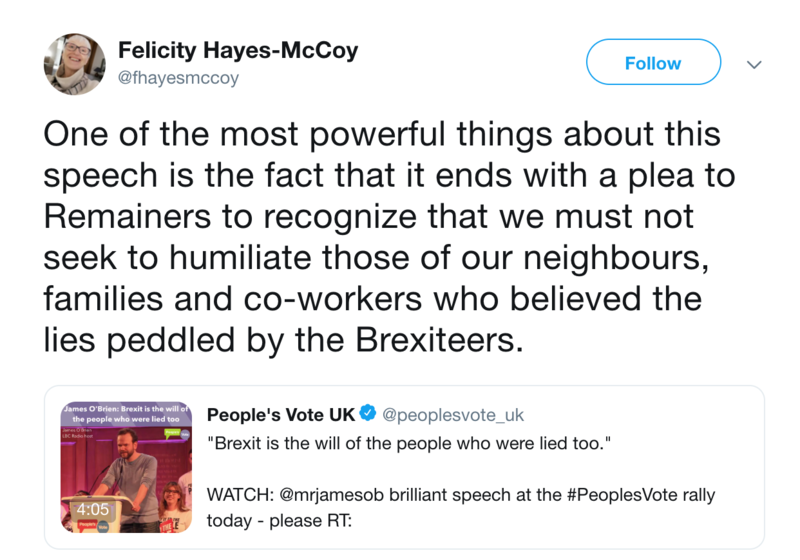 In 2016, I recognised that good people could vote Remain out of ignorance of what sort of spirit was *really* behind the EU, imagining themselves to be the goodies, whilst we who voted Leave were the baddies, or stupid. But now, in 2019, after we’ve seen how low the EU will stoop to get its own way? Why would anybody want to Remain in something like that? Surely most former Remain voters would vote Leave if there was a repeat referendum, provided they had an upright sense of right and wrong. Would they? If you ever read the comments on the bbc breakfast FB page you we find people accusing the BBC of both left and right wing bias. If they are ‘offending’ both sides equally, they are seeming representing both side and are not showing bias. The continual bleating of the remainers that Farage was getting unwarranted airtime and the exiters bleating about Campbell. Books that are effectively boardering on conspiracy theories should be a avoided. I wish that were true. But it does not logically follow that if you are offending both sides equally you are not showing bias. What has happened, as documented in Aitken’s book, is that the BBC are institutionally pro_EU (it’s largely a class thing) but when it came to the actual referendum they by law were obliged to offer equal time during the period of campaigning. This is what upset the Remainers who were useed to having it all their own way. But the fact remains that the vast majority of contributors, shows, news etc are biased against Brexit – hencee ISOB (In spite of Brexit) for good news – and BOB (Because of Brexit) for bad news. With all due respect, what is missing in all these discussions, irrespective of the cogent arguments and lament of the takeover of the BBC by liberal Marxists and fellow travellers is what the Bible says about these very days, which it calls the End-times or the Last Days. 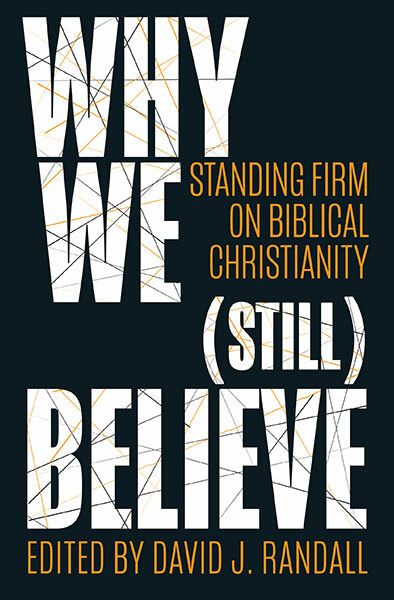 [Inasmuch as we] refute arguments and theories and reasonings and every proud and lofty thing that sets itself up against the [true] knowledge of God; and we lead every thought and purpose away captive into the obedience of Christ (the Messiah, the Anointed One). The BBC, academia and the EU, with the abject collusion of most of the main stream media are the forerunners of the World Government that will soon reveal its false prophet and its prophesied Prince, the Anti-Christ, by which time all will have the choice to bow down to him by taking his mark or refusing it and trusting in Jesus Christ for Salvation. God gave us a two-edged sword – it’s time to use it or lose it!